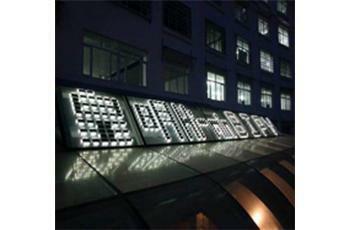 -The building can generate power by combining Winpin energy-saving glass with photovoltaic power generation technology. 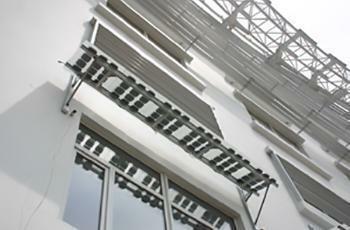 -The Winpin glass saves 75% energy than the common ones by using "Winpin coating" patent technology. -The glass can be used as roof, walls directly, which will be beautiful and elegant. The characters and letters can be designed according to requirements of customers. The PV panels can be built into a light collecting roof. 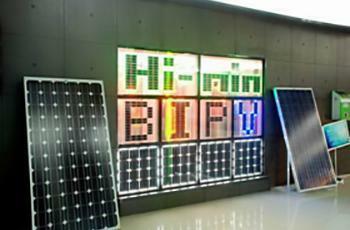 Electricity, generated by the PV modules with high inversion efficiency (up to 96%), is able to connect into the state grid for sales, and the state electricity is bought at night. The information, e.g. electricity output, discharge reduction of carbon dioxide, etc. can be displayed through its remote control system. The annual output of electricity on Sun-Moon Mansion is 20,000kw/h. Warm water in the shallow earth and the stagnant layer can be used for heating in winter by geothermal pump, while cold water is used for cooling in summer. It saves 23% energy than the conventional use of the ground source thermal pump. This technology combines equipments and suspended ceiling into one. 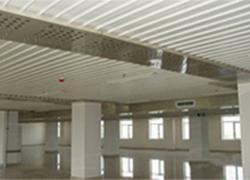 Adopting principle of heat radiation and pre-painted steel, the ceiling improves radiation effect as well as the decoration. Besides, the system does not bring much wind and noise when it works. 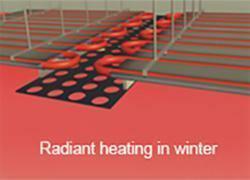 Compared with ground heating system, it is faster in heating and cooling. 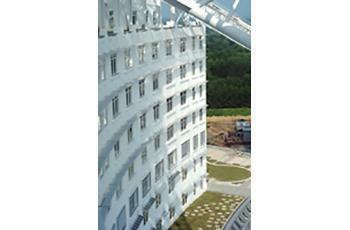 Moreover, the lightness of the radiating materials reduces building load greatly. The radiation technology, low in cost and simple in installation, can be applied in public buildings, such as hospitals, shopping centers, schools etc. Principle: It is a device to get fresh water by heating seawater or brackish water with solar energy. Solar air collector increases moisture absorbility of the air by heating it on the fact that relative humidity of air varies at different temperatures, and then produces humid air from seawater as a heat transferring medium in the process to get fresh water. Winpin energy-saving glass is made of double-layer glasses with argon gas between them, and the coating inside the glass is low-emissive one, a patent of Dr. Zhang, the internationally well-known "coating king". Advanced production equipments: There are two production lines of coating glass, two lines of insulating glass, one line of plastic-steel doors and windows, one of aluminum alloy doors and windows, etc., with high automatic level and productivity. Selection of qualified raw materials: raw glass: float glass used for cars auxiliary materials: the international well-known brand or famous national brand. Perfect production technique: the vacuum magnetic sputtering coating technology is adopted in coating glass production, while Austrian Lisec automatic production line for the insulating glass by wafer bonding, double sealing, filling with argon, secondary sealing with bicomponent gum machine. Solar air collector system (national patent 1 NO. 200820123062.7): Applying high-efficient evacuated tubes and heat collecting technology, air, the heat transfer medium, transfers solar energy into the water tank by way of heat exchanger for heating and cooling. Cross-seasonal energy storage in monimolimnion: By the feature of stagnancy of underground water in a certain depth, two wells are drilled in the depth of 200m, then extra heat energy is stored into hot water well from solar collectors by heat exchanger in spring and autumn, and then is consumed in winter, and at the same time, cold water goes down to the other well for summer cooling. 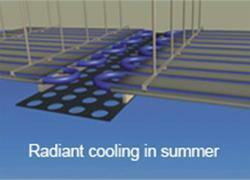 This technology achieves energy-saving greatly, namely, 35% for cooling, while 40% for heating. It uses solar energy to drive the duel-unit machine working with the principle of lithium bromide solution for cooling. Until now, the solar air-conditioning system adopted by the Sun-Moon Mansion is the largest one in the world. The heat collecting area of 9188.7m² and a total heat collecting power of 3310kw, this building has a cooling power of 1024kw through this machine, average coefficient of performance (COP) of which is 0.7, 1.3 in maximum; It meets 45% of the cooling in this office building. By applying solar energy, water inside the swimming pool can be kept at a constant temperature through the heat exchanger. Conventional energy is used in rainy days by shutting down the T-joint valve connected to solar collecting system. It saves 40% energy compared with using the conventional one solely. -Power generation--Realize the highest efficiency of lighting-electricity conversion all around the year by changing the angle between photovoltaic plate and the water level through adjusting the pushrod. -Sun shield—Shield strong sunray from entering into the house in summer to reduce load of air conditioner while it enables sunray to enter into the house to rise temperature inside in winter.